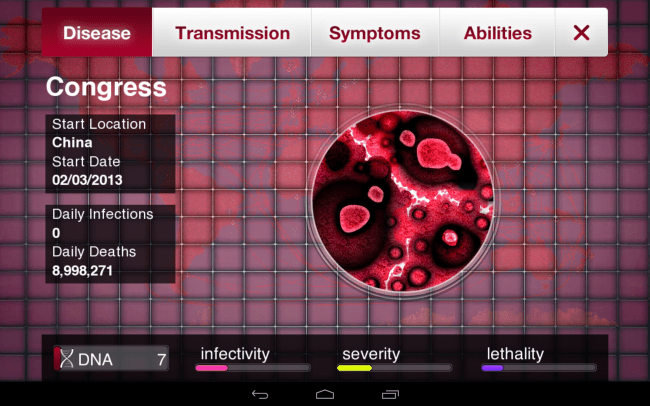 Home Gaming & Gadgets App Review: Plague Inc.
whilst adapting against everything humanity can do to defend itself. You know how in those deadly virus movies like Outbreak and Contagion, you find yourself rooting for the virus ? …yeah, um, me either. But that is exactly what you’ll be doing when you play Plague Inc.
Plague Inc. is a simulation and strategy game in which you develop, deploy and evolve your very own deadly virus, in which the only objective is the complete and total annihilation of humanity. Good times. It is an (*pun-alert *) infectious game that is simple and straight-forward in its (*pun-alert *) execution, if not delightfully morbid. From there, you are able to attach a number of free and paid genetic mutations to your virus strain. I played the Android version of the game – which is free and allows you to begin with a bacteria strain – but Plague Inc. also allows you to quickly unlock deadlier strains (i.e. virus, fungus, parasite, bio-weapon etc) and genetic mutations via in-app purchases… however, although you are able to unlock these options by simply playing the game, it is harder and more time consuming to do. Next, you are greeted with a Wargames style World map in which you decide what country your “patient zero” will originate from. This is the first strategic decision that you will make, as First World countries have more access to medical care (i.e. may detect your virus sooner), whereas Third World countries make it easier for you to spread your new disease, taking into account how the virus will spread (i.e. water, livestock, birds, access to ports, airports etc). I chose to start with China, due to their high population and combination of transportation options and urban / rural sprawl. Congress is Responsible For Over 8,000,000 Deaths a Day… Figuratively Speaking. Now that your virus has been unleashed upon the world (*insert maniacal laughter here *), it is time to help your new creation to grow and evolve beyond a harmless cold… and into something that emits bodily fluids from every orifice of its victim’s body (*insert pleasant imagery here *). As your new virus begins to infect more and more people – including crossing over borders and oceans – you start spending ‘DNA points’ on everything from the way that it is transmitted, the symptoms that arise, its resistance to climates, research and drugs, as well as how and when it becomes lethal… and this is where the strategy comes in. Since earning DNA points is made available in a limited fashion, you have to selectively pick and choose how they will be spent for maximum (and deadly) effect. Make your virus lethal too soon, and the World community will react by beginning research to quickly find a cure and/or shutting down its ports, borders and airports to prevent its further spread. Wait too long to make it lethal (or resistant to drugs) and you will find your new viral creation eradicated before it has a chance to truly spread its wings and wipe out the World’s population before a cure is found. Remember, “winning” is when your precious little creation has killed every man, woman and child on the planet before a cure is found. What Characteristics and Symptoms Will YOUR Virus Take? My strategy was simple: Focus my attention on the spread of the infection, but not immediately on the symptoms that might cause alarm or force people to go to the doctor, where it could be discovered. Once I had effectively infected and spread the virus to people in every country – and the disease could continue to spread on its own – I began to focus on its resistance to certain climates, drugs and treatment… and later its lethality, now that it is lying dormant in most of the World’s population. Each option has different levels which require the expenditure of DNA points. For instance, I may choose to have symptoms initially arise in the lungs, making my virus able to survive and be spread in an airborne fashion… thereby, infecting more people. But eventually I will need to ‘upgrade’ that ability beyond simple infection, to also include lethality, as well as to further unlock deadlier symptoms. All the while, you are able to easily keep track of how many people are infected in each country (or the World, as a whole) and how many fatalities you have. Eventually – when millions of people start dying – the World will notice, discover your creation and react to it. If you timed your strategy correctly, the virus will have already begun to quickly kill people, while also being resistant to treatment and slowing down the rate in which a cure can be found. It is around this time that DNA points will be harder to come by and you will also have to react in order to keep your precious flesh-eating pet alive. 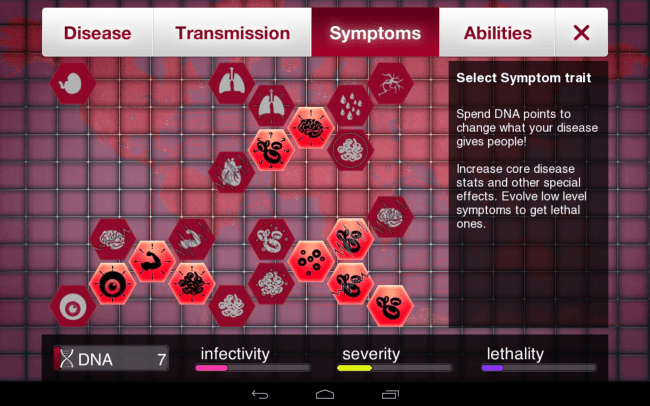 For example, if you have essentially already infected most of the population, you can ‘devolve’ many of the genetic upgrades that you evolved earlier in the game (relating to the infectious nature of the virus) and earn back some of your DNA points (at a loss) so that they may be spent elsewhere… like, for instance, increasing the lethal nature and killing speed of your disease. Throughout the game, you will also be treated to pop-ups that provide information about how your disease compares to other deadly pandemics in history (i.e. Small Pox, the Black Death) and even whether your virus has become more infectious than the common cold or flu. Plague Inc. also has great (and sometimes eerie, go figure) sound effects that help to signal certain milestones and events in the game. This includes announcements relating to countries who shut down their airports or began working on a cure in reaction to your virus, victims coughing or flat-lining, and natural disasters that occur in certain parts of the world (i.e. floods, earthquakes etc) that might contribute to your virus’s ability to spread more quickly in that region (for example, if it can be transmitted through water or blood transfusions). Congress Only Killed Half the World’s Population…But That’s Still Better Than Any Other Disease In History! Woot? 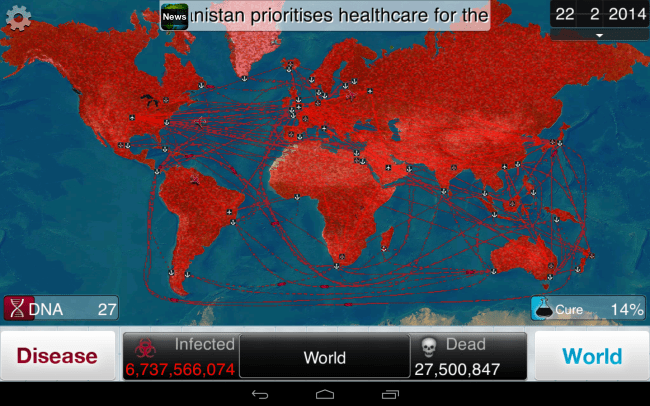 Although Plague Inc. is certainly a morbid game (when you consider what needs to be done in order for you to “win”), it is a great casual, “lean-back” game that will have you trying many different scenarios to achieve victory. I have not purchased any of the in-app upgrades – which I am sure would have a huge effect on my success – since many of these game developers clearly want you to spend more money and, as a result, practically make winning for free an arduous (and sometimes impossible) endeavor… but I would still recommend this game to anyone who enjoys innovative strategy games. Also, I understand that they will be releasing a new (purchasable) virus in the future that will create… wait for it …zombies (!!!) once people fall victim to your deadly sickness. You can usually bang out an entire game in less than 30 minutes, not to mention test your skills on higher difficulty settings.